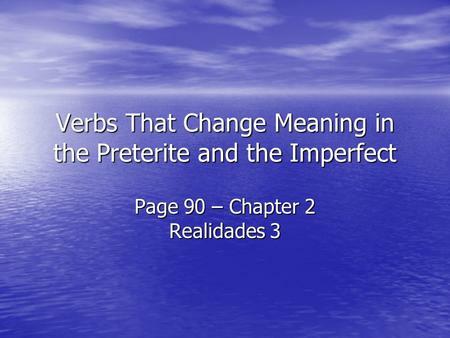 Verbs That Change Meaning in the Preterite and the Imperfect Page 90 – Chapter 2 Realidades 3. 3 SABER Imperfect – “knew” ¿Sabías que el concierto empezaba tarde? Did you know that the concert began late? 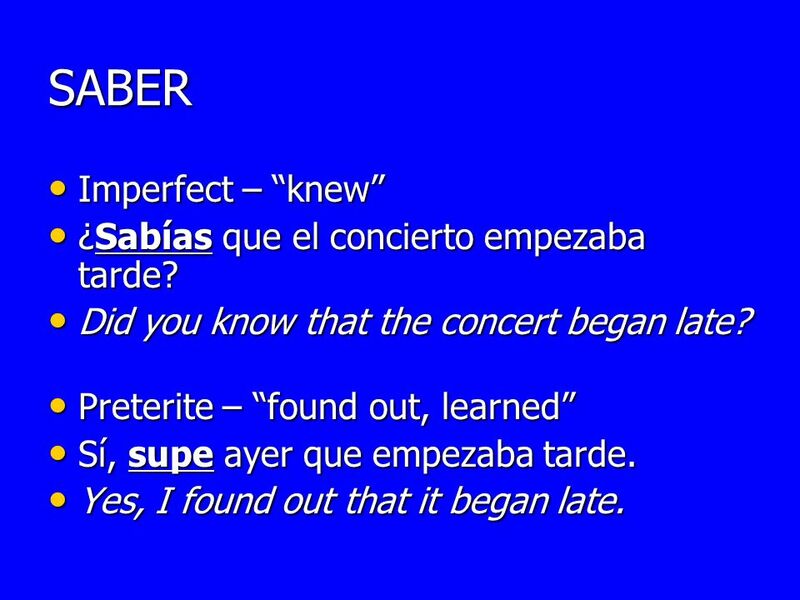 Preterite – “found out, learned” Sí, supe ayer que empezaba tarde. Yes, I found out that it began late. Pedro conocía muy bien a esa actriz. Pedro knew that actress very well. 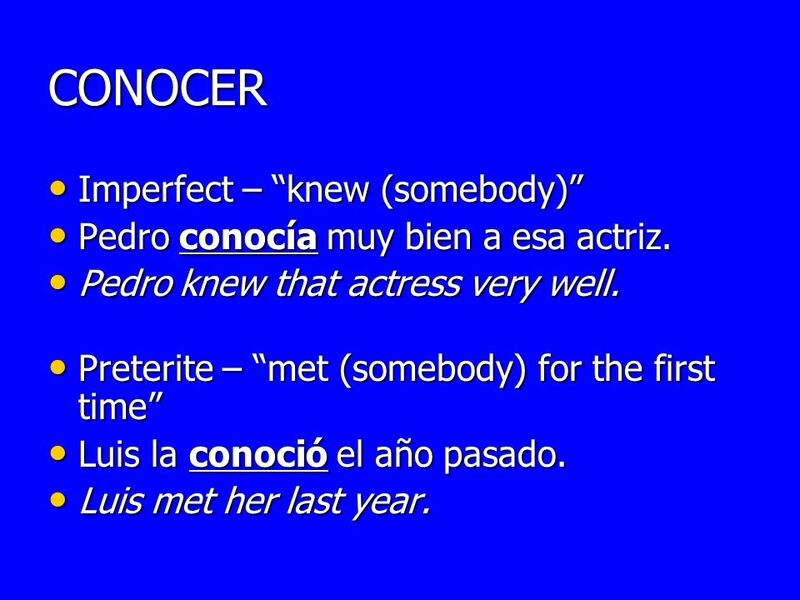 Preterite – “met (somebody) for the first time” Luis la conoció el año pasado. Luis met her last year. 5 QUERER Imperfect – “wanted to” Luis quería comprar las entradas hoy. Luis wanted to buy the tickets today. 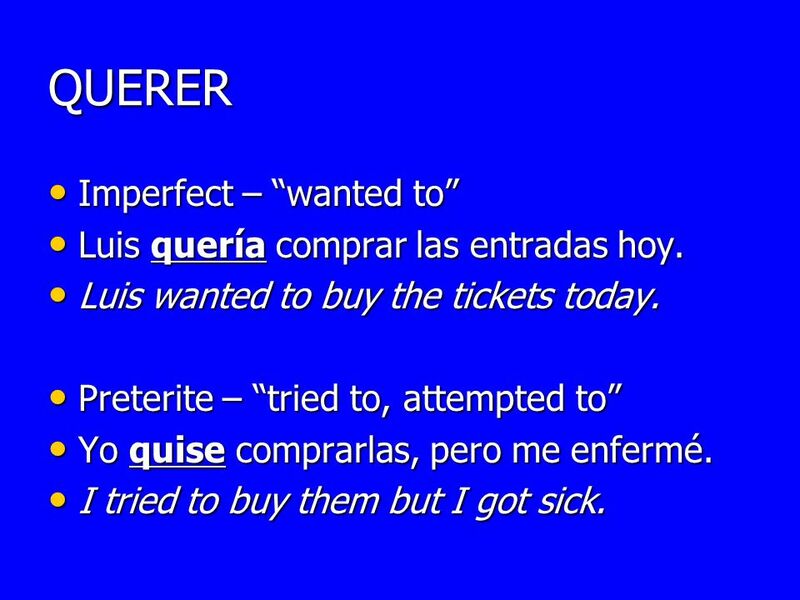 Preterite – “tried to, attempted to” Yo quise comprarlas, pero me enfermé. I tried to buy them but I got sick. No querían ver esa obra de teatro. They didn’t want to see that play. 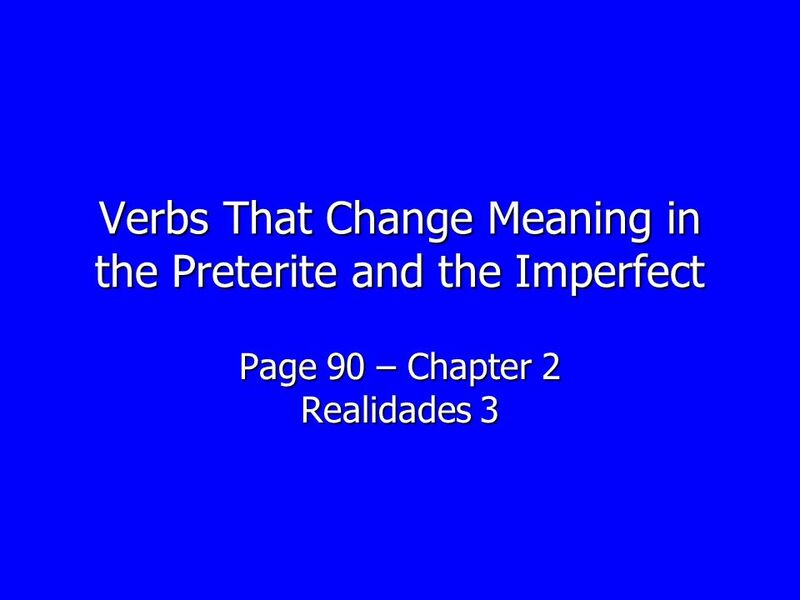 Preterite – “refused to” No quisieron ver esa obra de teatro. They refused to see that play. Ella podía aprender la letra de la canción. She was able to learn the letter of the song. 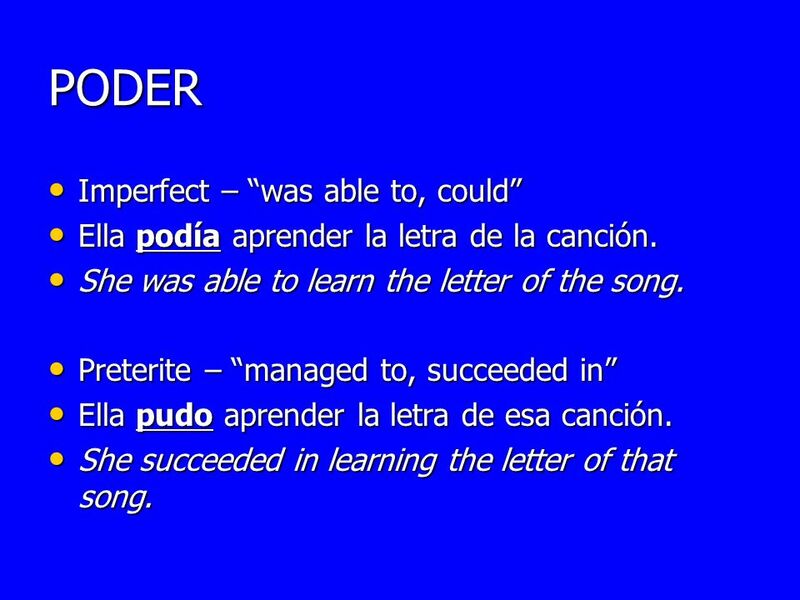 Preterite – “managed to, succeeded in” Ella pudo aprender la letra de esa canción. She succeeded in learning the letter of that song. 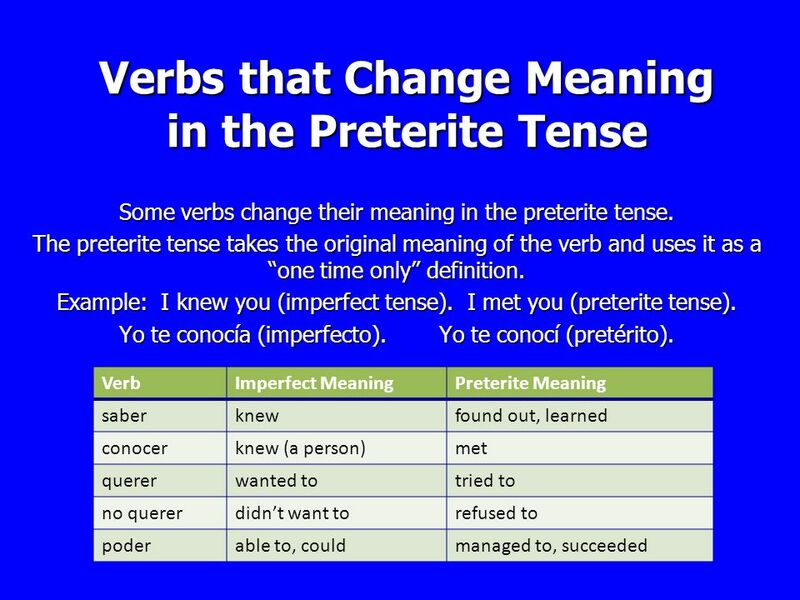 Descargar ppt "Verbs That Change Meaning in the Preterite and the Imperfect"
El Pretérito o El Imperfecto Which one should I use? 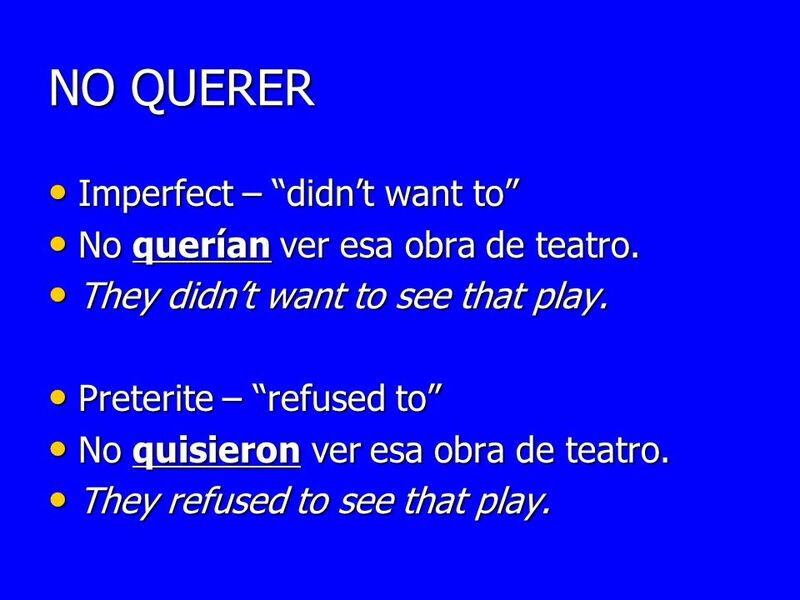 The Imperfect In this presentation, we will look at another way of talking about the past. Español 5. 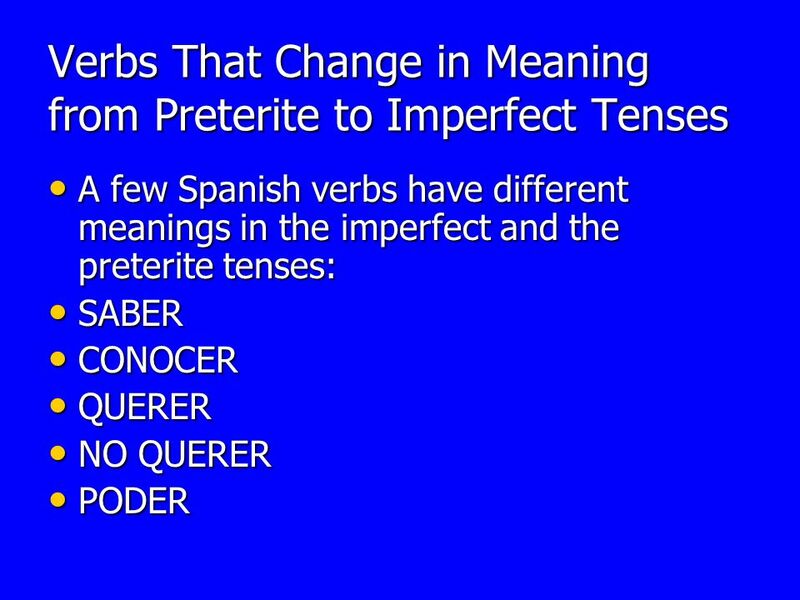 CONOCER PRETERITE DEFINITIONIMPERFECT DEFINITION MET FOR THE FIRST TIME: BEGINNING OF KNOWLEDGE CONOCí A MI MEJOR AMIGA EN LA ESCUELA PRIMARIA. Remember that ser and estar both mean to be. They are used in different situations and have different meanings. Ser y estar.